After so many years of studying, researching and living, I’ve come to the conclusion that many of the philosophers before me have made: That there is NO SUCH THING AS A COINCIDENCE. Ever since we were little, we’ve spent most of our lives listening to other people’s advice and opinions. After all, that’s how we were brought up to be. We were told to listen to our parents as little kids. We were told to “behave at school” by our teachers. When we graduate, we do exactly as we’re told by our bosses. We’ve spent all our entire life listening to what others tell us we should and shouldn’t do; all this time, ignoring our inner voice. When we’re constantly listening to others, and we continue to ignore our own inner voice, we gradually lose track of who we have come to be. When we lose our own voice, we’ve lost our real selves, because all this time, we’ve spent it all adhering to what others expect of us. And when we conform to what others want us to be, we’re no longer the person that we have come to be. Then, as if by some MAGIC, the universe always wants to put us back on our path: to help us live the life that we were meant to live by becoming who we have come to be. And how does this happen? Through a series of little “coincidences” to hopefully get us back on our path. Unfortunately, we’ve been brought up to stop believing in such nonsense, that there is no such thing as a coincidence, so we keep missing the signs – OVER AND OVER AND OVER AND OVER AGAIN… Until we’re hit with something big (and usually tragic) like an illness or the death of a loved one. Such events, though horrific as they may be, were not designed to keep us in our misery. In fact, when we change our perception about the events, we’d realise that most of the tragic events in our lives were also our greatest source of growth at that time. For today, think back on all the little “coincidences” in your life. Instead of concentrating on the bad or negative emotions associated with them, look at the coincidences through the eyes of a child – with CURIOSITY. 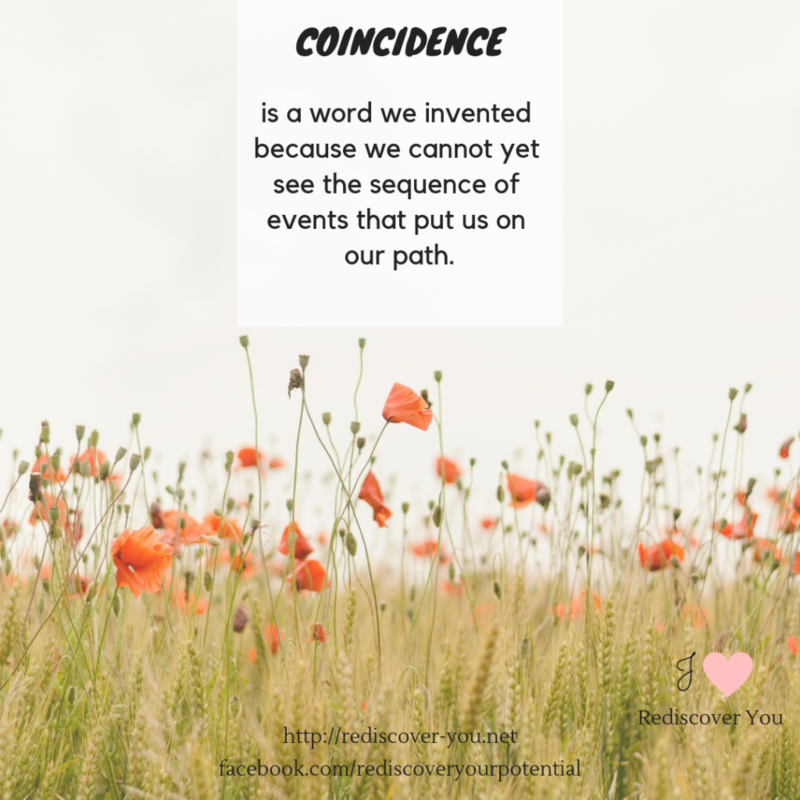 You’ll find that they weren’t coincidences at all: that in fact, they were a series of well-planned events to help you experience and grow in this lifetime.